If you live in a hail-prone area, you’re probably no stranger to those balls of ice that come in the middle of a heavy storm, and you know that they’re no joke. In fact, in June of 2010, hail fell in Vivian, South Dakota that measured eight inches in diameter—about the width of your average dinner plate. Luckily, most hail is a lot smaller than that, but it doesn’t mean it still can’t do its fair share of damage, particularly to your roof. Hail can cause all kinds of havoc up there, everything from a few loose shingle granules to leaks and deterioration. Typically, homeowner’s insurance will cover the repairs that come with shingle damage, but not the ones you don’t identify in a timely manner. And that’s the big problem with hail damage: often you don’t notice it until it’s too late. Most storms won’t completely wreck your roof, but they will compromise the structural integrity of your shingles and underlayment, leaving you vulnerable over time to leaks, rot, slipped shingles, and other deterioration. Today we’ll talk through the most common ways hail storms can cause damage to your roof, and teach you how to spot and repair hail damage—before it becomes an issue. You may also be interested in learning how to fix a roof leak while it’s raining. Find out here. Loose Shingle Granules. Hail can cause the little flecks of ceramic on shingles, otherwise known as the granules, to loosen and fall off. While this might not seem like a big deal, enough missing granules can expose the asphalt coating below. When that happens, leaks are likely not far away, as the exposed shingle can only hold up to the weather for so long after that. Hail Hits. These small depressions on the roof occur where large hail stones directly strike the surface. The impact points are typically soft, like a bruise on an apple, and they can lead to water infiltration and further deterioration. Loose, Broken, or Missing Shingles. Impact from hail stones can also cause shingles to crack, which can quickly lead to shingle loss. In fact, cracks that happen during storms may be affected by wind lifts, leading to broken or missing shingles. Cracked Fiberglass Mat. Occasionally, an impact will be so severe that it will damage the fiberglass mat below the asphalt surface. This kind of damage isn’t always apparent, but it can lead to water infiltration over time. Loose granules are easy to spot, since they typically collect in gutter downspouts. Similarly, you can often see slipped shingles from the yard, especially if they wind up on the ground. However, it’s generally not a good idea to get up on your roof and investigate further, since it can be dangerous. If there is a large storm in your area, have a roofer or insurance adjuster out for an inspection. It’s often free, and it can save you the trouble of getting up on a ladder. Just keep your eye out for “storm chasers,” roofers of ill repute who pop up after a storm. These storm chasers typically perform shoddy work in order to get a job done fast, and they may skirt insurance laws as well—and that can land you in lots of trouble with your state insurance commissioner. The best idea is to go with a roofer who has a local brick-and-mortar office, staffed with real employees, rather than someone working out of a truck. 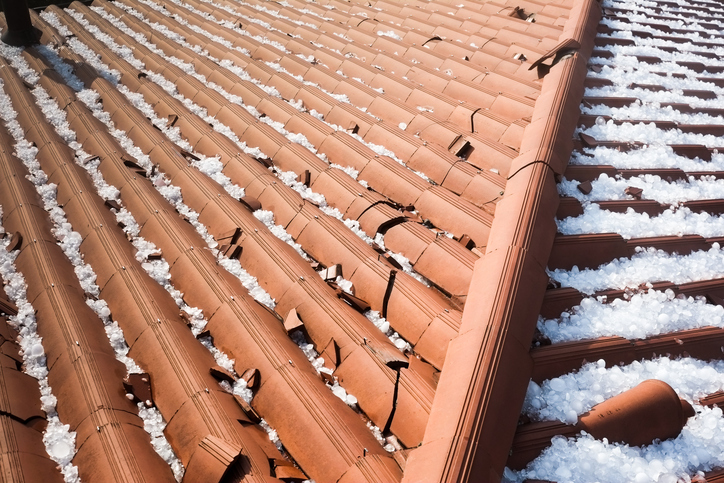 If you suspect that your roof has been damaged by hail, the repair should be covered by your homeowner’s insurance policy. You’ll likely have to meet your deductible first, so you’ll want to review the details of your plan to see how much that will be and to understand what level of coverage you’ll have. Another thing to do right away is to document any damage. We don’t recommend that you get up on the roof yourself, but if you’re able to see the damage from the ground, or if there is any roof debris—such as missing shingles in your lawn—snap a few photos of these. 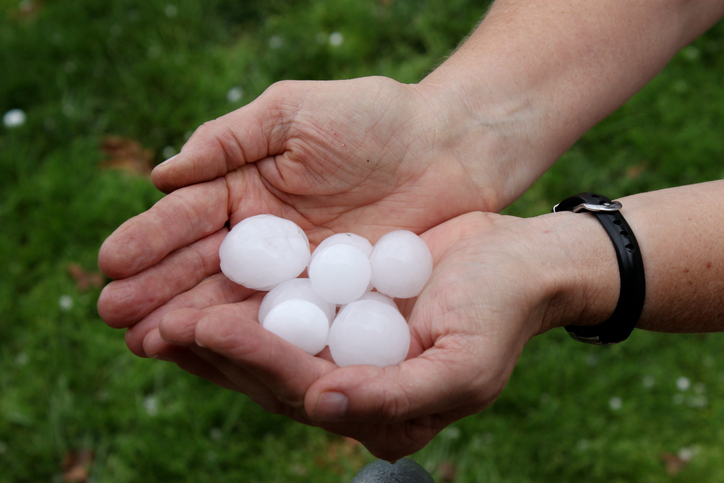 If possible, you should also get a few pictures of hail stones to give the adjuster a sense of the size of the hail. Your next move is to contact your insurance company, who should either send out one of their own inspectors or arrange to have a roofing contractor visit to inspect your roof. This inspector will examine the extent of the damage and make recommendations for repairs. The recommendation may be for more than a few new shingles, however. Hail damage often causes extensive issues with the underlayment and other materials supporting the shingles, so it’s not uncommon for an inspector to recommend a complete replacement of the roof. That’s especially true if your roof is older, or if the damage is widespread. However, this may not necessarily be such a bad thing. Newer roofing materials are much stronger and more weather-resistant than their predecessors, which means your roof may be able to stand the effects of wind, hail, and storms for years to come.